The Forum on Indigenous Learning and Teaching was held at the University of Melbourne in December 2009. 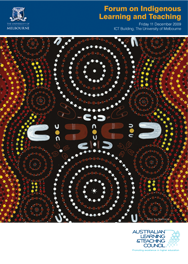 It represented a unique and timely opportunity for enhancing Indigenous teaching practices in Australian universities. Many high profile academics from universities around Australia participated in the Forum and it was a rare privilege for Indigenous and non-Indigenous teachers to meet and discuss their endeavours in this vital dimension of Australian higher education. Several of the presenters at the Forum have kindly made the audio files and powerpoint slides from their presentations available below. Indigenous Cultural Competence: Whose competence? Whose culture?